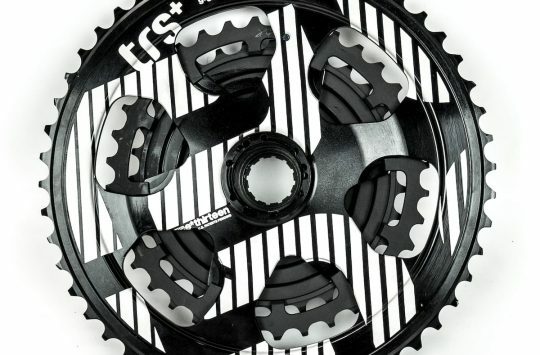 Taking advantage of their TRSr cranksets’ interchangeable spider interface, e*thirteen’s Direct-Mount Guidering M chainring shaves a good deal of weight while adding the security of a narrow/wide profile. How much weight? Despite alloy arms and a massive 30mm bottom bracket spindle, our TRSr set (with BB) weighs in at 678g- within 25g of a same-size XX1 setup. 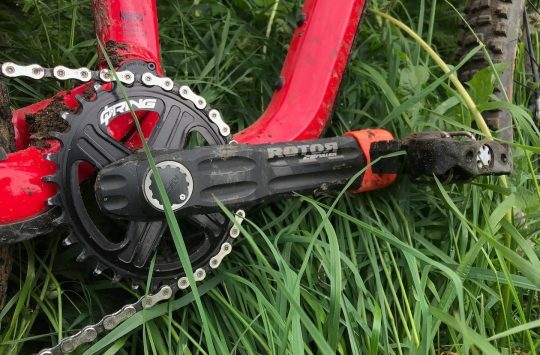 While the company’s bottom brackets have left something to be desired (see issue 88 TRS+ crankset review), improved models are on their way – and there’s a lot to be said for making one’s most bash-prone parts of the bike out of aluminium. Bearing issues aside, the Guidering M and TRSr setup has been quiet and trouble-free for over eight months. 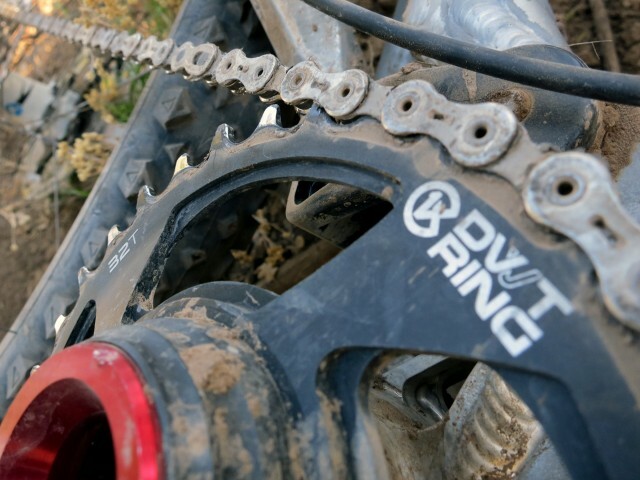 When used with an XX1 rear mech, the chain has never once dropped, despite having been ridden without an ounce of grace. The ‘ring is biased ever-so-slightly toward the bottom of 11s cassettes- but is nearer centre on more common 1×9 and 1×10 setups. 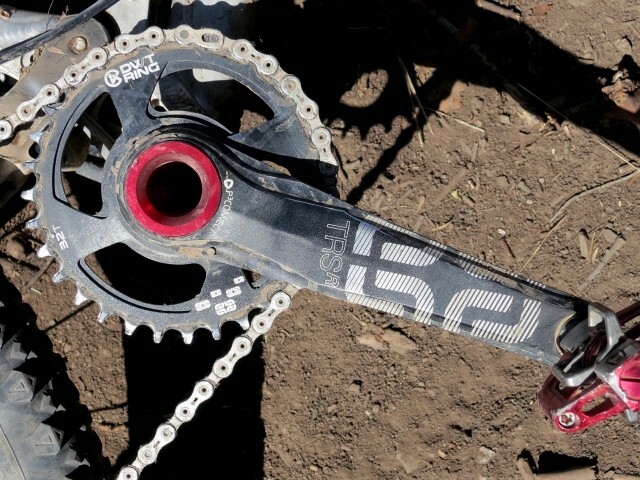 All in all, e*thirteen’s Guidering M narrow/wide profile is right up there with SRAM’s X-Sync in terms of wear and noise. Beyond saving weight, going without the standard spider allows e*thirteen to offer the Direct Mount Guidering M in even sizes from 28-38t (a standard 104mm version can be had from 32-38t at the same price). The disadvantage to this setup is the need to remove the cranks for chainring swaps. 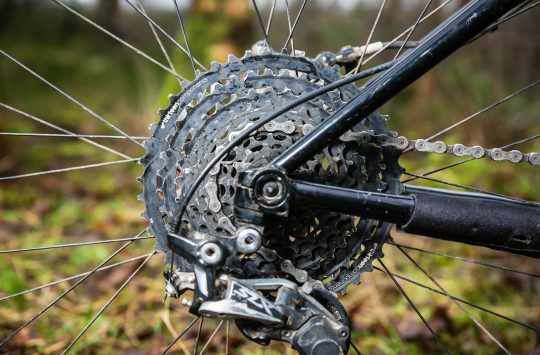 For set-and-forget types, the aesthetic, chainring choice, and weight advantages will easily outweigh the slight fitting hassle.